Ah, fish—the quintessential dieter’s dinner. This lovely meal is a far cry from the bland fillets you may be expecting. Poaching (cooking in barely simmering liquid) is usually done on the stove. But this oven technique surrounds the fish with gentle heat—overcooking is virtually impossible. For the halibut, sauté shallots, garlic, and pepper flakes in oil in a 10-inch nonstick ovenproof skillet over medium heat for 1 minute. Deglaze with wine and simmer until liquid is nearly evaporated, about 2 minutes. Add broth, tomatoes, beans, and vinegar; simmer 3–4 minutes, or until liquid is reduced slightly. Season with salt and pepper. Nestle fillets in the tomato-bean mixture and transfer pan to the oven. Poach for 20–25 minutes, or until fish flakes easily with a fork. For the escarole, steam escarole with water in a large sauté pan over medium-high heat, covered, stirring occasionally until wilted, 2–3 minutes. Season with salt and pepper. Divide greens among 4 shallow serving bowls. 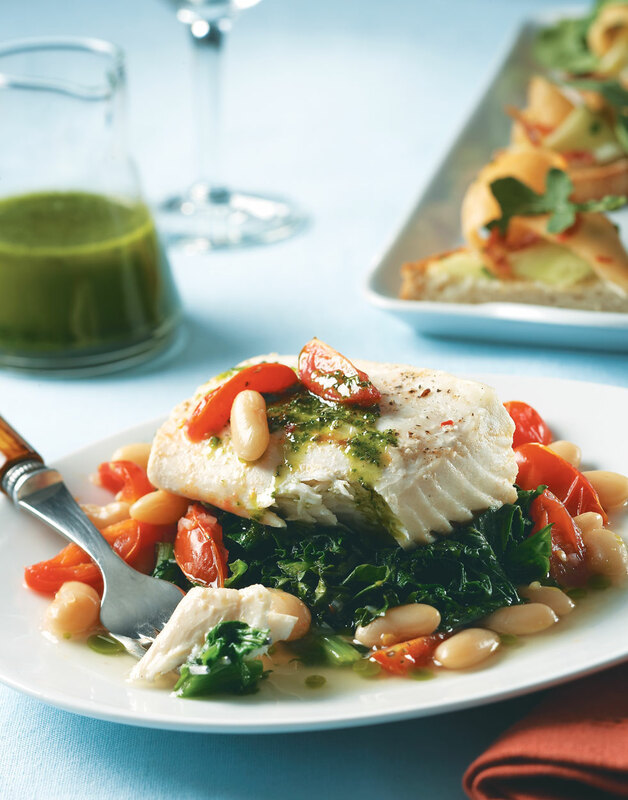 Spoon tomato broth around greens and top with a halibut fillet.